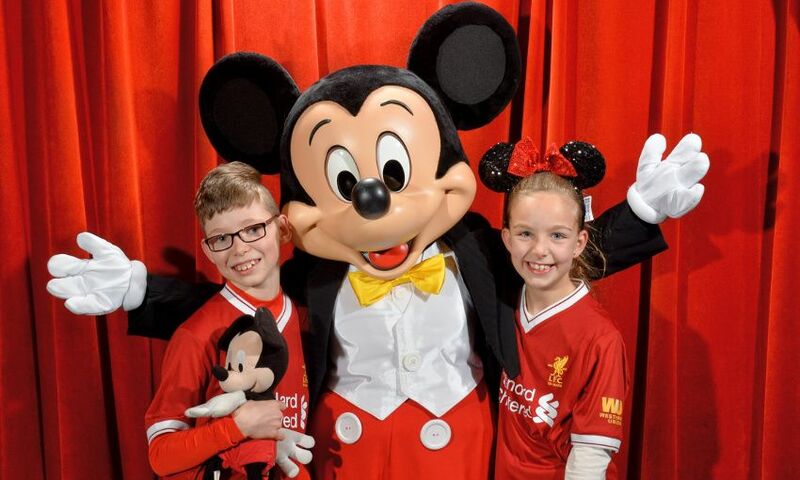 Young Red Sam Kilburn had his dream of meeting his favourite LFC players and Mickey Mouse come true when his family was selected as the lucky recipients of #LFCDreamTicket. Sam, Charlotte, Gary and Karen Kilburn were treated to the surprise of a lifetime when the club worked with partners Joie and Thomas Cook Sport to create two weeks of unforgettable memories for a very special family. Sam, age 10, from West Derby, was born prematurely and has suffered from cerebral palsy since birth when doctors discovered a bleed on his brain, later developing epilepsy too. Thanks to the tireless support of his family, for the last 12 months Sam has attended the LFC Foundation’s Respect 4 All inclusive sports sessions and, along with his loved ones, Sam has rapidly become a key member of the team bringing to life all of the club’s values. The fortnight of fun was kicked off with a special visit to Melwood where the family got to meet their favourite players, including LFC’s newest recruit Alex Oxlaide-Chamberlain, who presented them with tickets to have an extraordinary Anfield matchday experience. At the game, where the Reds soared to a 3-0 victory over Huddersfield, the surprises continued when LFC legend and club ambassador Robbie Fowler presented the Kliburns with the trip of a lifetime to Disneyland Paris.